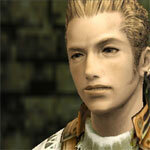 The lighthearted hero who lost both his parents and dreams of one day having his own airship. He sets out from his home in the heart of Dalmasca to become a sky pirate. He looks on the future with an air of hope. Daring though he is, he relies greatly on his partner, Fran. He fights with firearms and commands his own airship. A man without a country, he nevertheless is a sky pirate with a code, stealing only from the wicked. He�s a skilled mechanic who has a way with jokes and women. 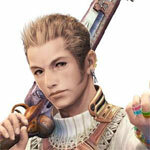 Balthier�s devoted partner. A viera warrior, she is possessed of superior wisdom and stamina. Able to wield any weapon, she is as skilled with swords as she is with her bare hands. 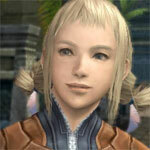 She also excels as an archer and plays an active part in maintaining the airship. 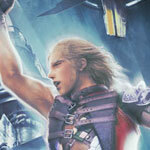 A Dalmascan General who has been victorious in numerous battles, he is a hero with a strict sense of justice. 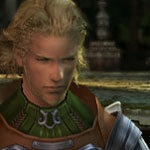 Recruited from the ranks of the commoners, he enjoyed overwhelming popularity amongst the Dalmascans. However, during the arbitration ceremony with the Arcadian Empire, he murders the King of Dalmasca. Why would someone as loyal as him assassinate the king? Her whereabouts since the Archadian invasion are unknown. The rightful heir to the Dalmascan throne, she also leads the resistance. She�s tough, iron-willed and carries herself with dignity. 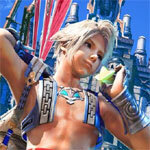 Penelo lives among the same bustling streets as her boyfriend, Vaan. She, too, lost her family in the war but still enthusiastically goes about making her living in the bazaar. Though a talented singer and dancer, she is no stranger to battle, having learned to fight from her brothers, who once belonged to an order of knights. She overcomes any obstacles in her way and exhibits strength of character in all she does.